The final siren sounds and North Melbourne has defeated Collingwood by 30 points in an upset win. This confirms them as finalists this season and anything can happen. Brent Harvey has been a star tonight. We keep forgetting how old he is. In this sort of form 400 games won't be an issue. BEHIND KANGAROOSCollingwood rush the ball through under pressure as they try to mount a final challenge. 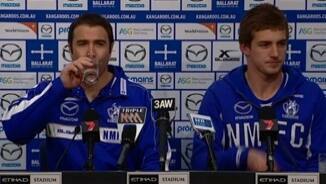 North Melbourne are standing up and announcing themselves as a contender. That's right. They are a contender. They can beat anyone on their day. Well maybe Hawthorn could be a challenge! BEHIND KANGAROOSPetrie takes another mark inside 50. This time the kick is a wobbly jobbly one and it misses to the right. BEHIND KANGAROOSThe ball is cleared by the Magpies defence but it comes back to North and MacMillan comes through and kicks, but he misses to the left. GOAL KANGAROOSNorth Melbourne are standing up to the big guys and are saying what about us? Petrie marks 15 metres out directly in front and slams it home. 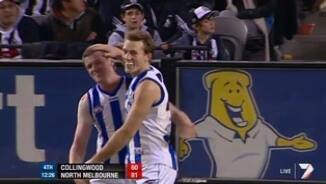 Kangas by 27 points. Collingwood are mounting a challenge. Question is can North Melbourne hold on and announce themselves? GOAL MAGPIESBeams marks inside 50. 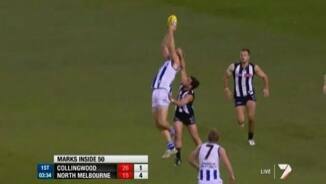 He handballs to Pendlebury who finishes it off with a minimum of fuss. Collingwood have activated their substitute with the speedy Mooney coming on for skipper Maxwell. The siren sounds for three quarter time with North Melbourne holding a 27 point lead. Maxwell receiving treatment on an ankle. It would be a huge blow if he is unable to come back on. BEHIND MAGPIESCloke marks in the pocket, but his shot starts right and stays right. The Kangaroos have activated their substitute with Campbell on for Garlett. GOAL KANGAROOSHarvey marks 53 metres out. He looks for the option and Ziebell presents 40 metres out. He goes back and kicks the goal. WELCOME BACK JACK! North Melbourne by 28. BEHIND MAGPIESMcMahon desperately punches the ball through for a rushed behind. Collingwood are lifting in their intensity for the contest and rest assured, North Melbourne do not have a big enough lead yet. GOAL MAGPIESThe ball comes back after the kick in and Beams takes the mark. Beams nurses it home for a badly needed goal for the Magpies. BEHIND MAGPIESFasolo marks strongly and will line it up from 40 metres out. He sends it on its way but the kick is poor. BEHIND KANGAROOSTarrant has it but he is under duress. He triesthe checkside but misses. BEHIND KANGAROOSHarper receives from Harvey but his shot misses to the left. GOAL KANGAROOSThomas marks running with the flight of the ball. He walks in confidently from 30 metres out and kicks his third. North Melbourne mean business tonight. BEHIND MAGPIESCloke marks out in front of Thompson but his kick goes to the left. GOAL KANGAROOSGoldstein marks outside 50 nd holds it up. He waits for Petrie who leads and takes the mark. Petrie guides it through and North Melbourne leads by 23 points. GOAL MAGPIESCollingwood are surging in numbers. Sinclair is on the end of it. He has nobody in front of him and goes long. It goes on and on and on and on for a goal! The siren sounds for halftime with North Melbourne surprise 22 point leaders. It may be a surprise result but one that is well and truly deserved. BEHIND MAGPIESCloke kicks around the corner. The goal umpire goes a long way to signal the behind. BEHIND MAGPIESDidak kicks long. It takes a leg break and just misses. Warnie would have been proud of that. BEHIND MAGPIESThomas marks as the loose option 40 metres out. His kick starts left and that's where it stays. GOAL KANGAROOSNorth surge forward once again. Tarrant pounces on it and snaps it for a goal. He has three goals and North Melbourne have 9! GOAL KANGAROOSGibson with a great tackle to release the ball. Goldstein handballs to Garlett who kicks it off one step. What a cracking goal! North Melbourne are in the house! BEHIND KANGAROOSGoldstein soccers of the ground but it's to the wrong side of the big stick. 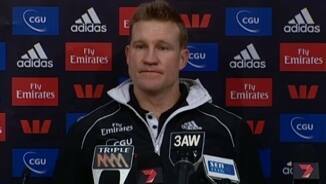 Collingwood look rattled at the moment. North Melbourne appear to have all the answers right now. GOAL KANGAROOSTarrant intercepts the kick by Wellingham across the ground and he plays on to kick the goal. North by 12 points. BEHIND KANGAROOSThe ball is kicked towards Tarrant but the Collingwood defence punches it through. Collingwood are not going to have it all their way tonight. GOAL KANGAROOSThomas is taken out of the marking contest by O'Brien who is a repeat offender. Lindsay Thomas becomes a repeat goal kicker with a beautiful goal! BEHIND KANGAROOSGoldstein handballs to Anthony who has an open goal in front of him and he misses. GOAL MAGPIESFrom the ball up, Blair pounces on it and snaps it through for a very good goal. You know when Collingwood score because the roof is raised with the noise. BEHIND MAGPIESSinclair has it deep in the pocket. He lines it up but it starts left and stays left. BEHIND MAGPIESFasolo snatches the ball and snaps, but it's left. BEHIND MAGPIESSinclair snaps from 35 metres out but misses to the right. At quarter time North Melbourne hold a one point lead after coming back from a 4 goal deficit. GOAL KANGAROOSThomas is out on the lead and O'Brien takes him high. Free kick to Thomas. He is no certainty from here but his kicking has improved. MY WORD IT HAS! North are in front. North are really coming at Collingwood. They are rolling the dice and taking their chances. For the time being it's rolling their way. GOAL KANGAROOSPetrie is one out and he lunges himself at the ball to take a good mark. He goes back from the 50 and kicks another. Here come North Melbourne! GOAL KANGAROOSTarrant rushes out on the lead and takes a good strong mark. He slots it through and North have two. BEHIND KANGAROOSGarlett has it just inside 50 and he goes for home, but it misses to the left. GOAL KANGAROOSHansen is taken out of the marking contest. He goes back and kicks North's first goal. BEHIND MAGPIESSidebottom puts on the burners. He chips it to Fasolo, but his snap under pressure misses to the right. GOAL MAGPIESGoldstein gets the hit out but Didak takes the ball. He looks up lets go and kicks a great goal. Didak is back! Collingwood has been very precise with their ball use tonight. BEHIND KANGAROOSGoldstein takes it out of the ruck and kicks, but he misses to the right. GOAL MAGPIESCollingwood wins the centre clearance and kicks to the forward 50. Fasolo is there at the fall of the ball. He pounces and kicks the goal. GOAL MAGPIESThomas spins and turns, handballs to Jolly who kicks to Tarrant and he marks out ahead of Firrito. Tarrant makes no mistake. GOAL MAGPIESCollingwood keep the pressure inside their own 50. The ball spills out to Beams who throws it onto his boot and snaps truly. BEHIND MAGPIESCollingwood rebounds quickly with Sinclair running into an open goal and missing to the right. Matty Campbell is North Melbourne's substitute. Petrie takes a mark deep in the pocket but he kicks it out on the full. Collingwood had a late change with Mooney coming in for Toovey. Mooney is the substitute. We are off and underway for tonight's big one. Welcome to Etihad Stadium where both teams are engaging in a must win match for different reasons. It's Collingwood vs North Melbourne.